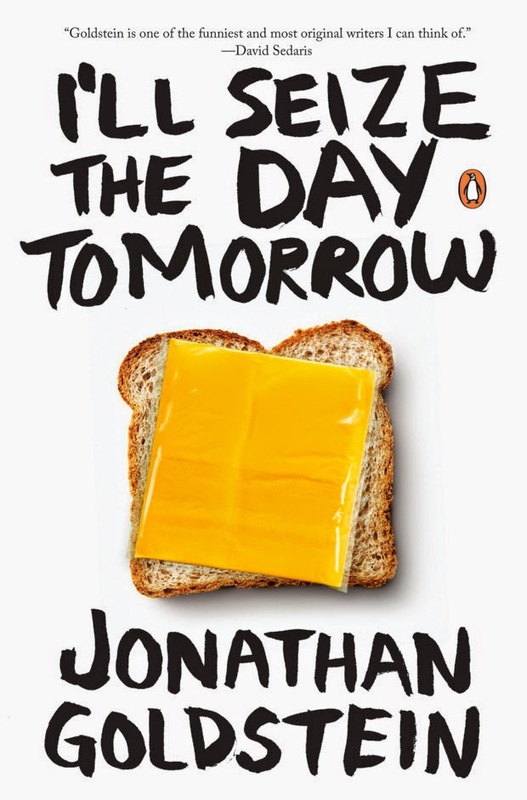 I hate the font used on the cover of I'll Seize the Day Tomorrow, but aside from that little detail, this was a fun book. Organized as a year-long, angst-filled countdown to Jonathan Goldstein's 40th birthday, the book is essentially a compilation of snippets from his radio show, Wire Tap, that airs on CBC. Many regular characters from the radio show make appearances. In fact, I remember hearing some of these stories before, which to me is not a problem. A good story always bears retelling. And I am sure I am not the only person for whom the radio voices escape the page, so it is almost like I am hearing, rather than reading, the stories. I was hoping that Goldstein's parents would make more of an appearance, because you can never have enough Buzz and Dina Goldstein, in my opinion, but sadly, no. I'll Seize the Day Tomorrow is made up of short snappy segments for the ADHD-leaning readers amongst us and all the angst that one expects from a CBC personality with a This American Life pedigree. Sounds interesting. CBC has some fantastic programs. Must add to my list of to reads this year! It's an entertaining little read, Karen. Not as vital to my existence as some of the CBC programming, like for instance, As It Happens, but still fun. As you may remember, we didn't always see eye-to-eye on Jonathan Goldstein. But, I'll second your thoughts on the title font. It looks a bit on the psychotic side, when I'm not really gathering that that encapsulates the book. Psychotic, I never viewed the front that way, John; I was thinking it was childish. But you could be right.Regardless, it's not the right font for this book. Or any book, actually. It's especially good for those angsty-humour days, Erik.